European explorers reached North America more than 400 years ago, and since that time Native Americans have had to struggle to survive. Yet, despite injustices both past and present, the Native American community has persevered over the centuries. 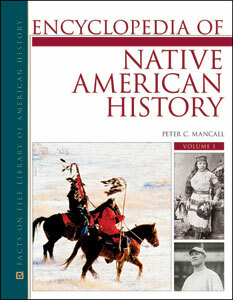 The three-volume Encyclopedia of Native American History offers a comprehensive and authoritative look at the most important individuals, events, and topics in American Indian history. Researchers and students alike will benefit from the in-depth coverage of tribes, notable leaders and events, customs, dress, dwellings, weapons, government, religion, and more. Covering the period from the first human settlements in the Americas to the present day, this set features black-and-white photographs, an insert of full-color maps, an appendix, and cross-references. Written for high school and college students as well as the general public, this resource will be invaluable to anyone interested in learning about this fascinating topic.